Packed with micronutrients – aka the vitamins and minerals that give your body nourishment and protect you from disease. Much cheaper. If you’re trying to eat all organic, changing your meal planning seasonally will help your budget as it tends to be less expensive. Some of the best flavors of fall are in season right now: pumpkin, apples, cranberries, sweet potatoes, beets, pears, kale, brussels sprouts, and squash. Butternut squash, for example, is full of vitamin A (helps protect your eyes from degeneration), vitamins C & E (antioxidants that boost your immune system), potassium (good for blood pressure), magnesium (good for your muscles) and fiber (helps aid digestion). 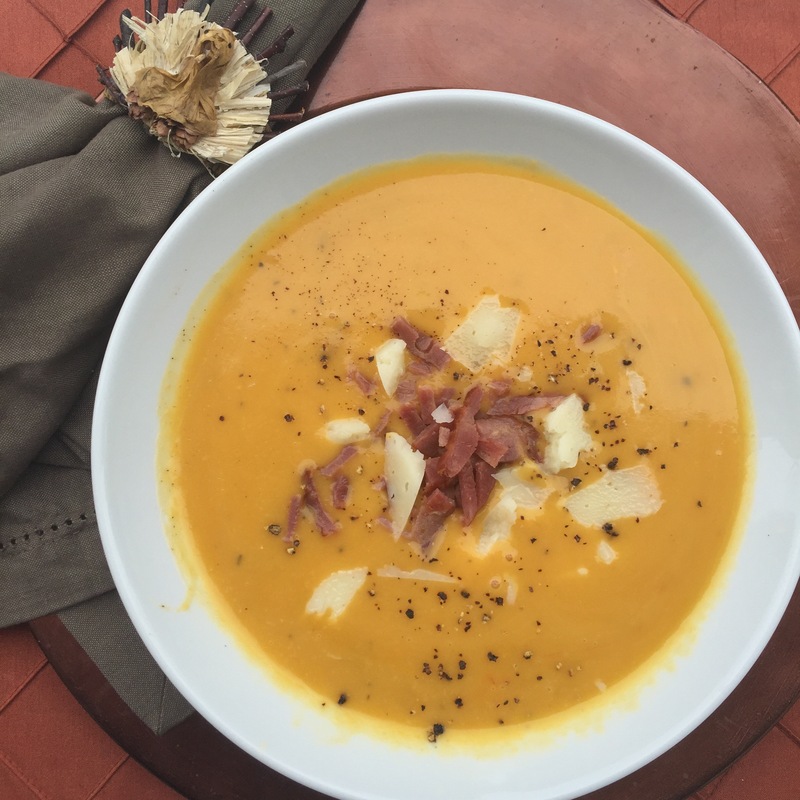 Today, I’m sharing a super easy three-step recipe for Butternut Squash Soup. Cut butternut squash in half and scoop out seeds. Place halves cut-side up on a pan covered in aluminum foil and put in 425 degree oven – roast for 45 minutes to an hour, until tender enough to stick a fork through. Scoop the roasted squash out of its skin and put in a bowl with all other ingredients. (If broth is cold, warm in a pot over the stove and you can just mix the soup there.) Use an immersion blender to mix everything together and it’s ready. You can also put all ingredients in a regular blender. Feel free to garnish with bits of bacon, manchego cheese, or roasted pumpkin seeds. Enjoy!